On my property I have a small raspberry patch that contains 5 red raspberry bushes. In the past they did okay but I wasn't overly impressed with them. Well, last Fall and earlier this Spring we gave them all a good fertilizing with fertilizer that is specifically for berries bushes. I am happy to report that it did the trick and this past July I had the BEST red raspberry harvest ever! I picked 7 large containers of fresh berries over a 12 day period of time and froze them until I was ready to make my jam. 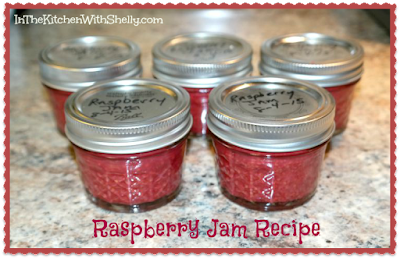 The recipe that I like to use for making and canning red raspberry jam is from the Ball Blue Book - Guide to Preserving on page 53. Here's the recipe. Prep: Wash red raspberries under cold water; drain. Gently crush berries one layer at a time using a potato masher until you have 5 cups of crushed raspberries. Cook: Combine crushed red raspberries, water, granulated sugar and pectin in a large saucepan, stirring to blend everything together. Bring mixture to a full boil over medium-high heat, stirring constantly; boil hard for 1 minute. Remove mixture from heat and if gel begins to form before 1-minute boil is completed, skin off foam if necessary. Fill: Ladle hot jam into a hot jar, leaving 1/4" headspace. Remove air bubbles, clean jar rim and adjust band to finger-tip tight. Place jar on rack of the water bath canner over simmering hot water. Continue until all jars are filled. Process: Lower the rack into the simmering water. The water must cover jars by at least 1" over the top. Adjust heat to medium-high, cover canner and bring water to a rolling boil. Process half-pint jars for 10 minutes. Turn off heat and remove cover. Let jars sit in the hot water for 5 minutes. Remove jars from the canner. Cool jars for 12 hours. I keep on saying that I must start canning, but somehow never do it. I love fresh fruit that is preserved this way, so maybe this recipe will b my inspiration.